I have been blogging for a while now and reading back over the blogs that I have written I realise that I have somewhat focused on the negatives that we are experiencing, and thinking about that I guess it's not too difficult to see why this is so. Social workers are just people doing a job and of course like all of us they are sometimes less than perfect; however they are dealing with people’s lives so even simple mistakes can be emotionally wounding. We became very aware of this through our own experience and also that of friends who have also been through the adoption process. It can be as simple as failing to immediately tell you of a change in the panel date - which of course means a huge amount to you, but is just a correction in a diary to them - to fundamentally not “getting it”. We soon realised - and it was a shocking realisation - that we were in it over our heads. We had listened intently at the prep' course, read copiously, had scoured the internet, picked the minds of the experienced parents around us; we thought we were prepared. However, can anything truly prepare you for the impact of an adopted child coming into your life? Especially when a child displays the trademark behaviour of a traumatised child? I grew up in the 60's/70's and had a pretty idyllic childhood in the English countryside. My oldest memories are of playing out with a friend of the same age, the pair of us wondering around alone in the village that my family moved from when I was just 5. We moved to a small town and my siblings and I played out alone from the day we arrived, this included playing in playgrounds, on farmland, building sites and also at the beach (as well as in the sea) which was a 2 mile walk from our house and a journey we undertook on foot quite regularly. We adopted two brothers who we knew to be part of a sibling group of 5. We were later to discover that in fact there was an additional, older half sister (paternal), as she lived with her mother she had nothing to do with social services or indeed us. Our daughter has not been with us for very long and my first conversation with her happened unexpectedly on Christmas Day. It's the first time I really haven't been able to figure out a way to give her what she yearns for and needs. She came home from school a bit quiet and sad and when probed about why, just kept saying "I don't want to tell you, I don't want to tell you". Christmas has been different this year.The decorations are up, the cake and turkey were cooked and eaten but something else happened. It was months in the limbo stage; all the usual social services blurb and all the red tape, and now suddenly she’s here in time for the celebrations. Our beautiful daughter!This is our second time around and most of it feels old hat.We are familiar with all the upheaval and the feeling of being emotionally dishevelled, but this time we had an added element to consider - our beloved son.We have been amazed by his reaction to all of this. He is 4 but blimey! – it feels like he could be 24!He has taken all of this on board and has shown courage, compassion and an immediate beautiful love towards his new sibling. It's like watching a beautiful masterpiece being painted, watching him shape his enthusiasm, outline and profile his brotherly reactions and eagerness to embrace and cuddle his future. A future that he will now get to share with someone else.I am awestruck at how willing he is to accept this baby so unconditionally. We were both apprehensive of course and I definitely was nervous about where I was going to find the same equal, immeasurable quantity of love I hold for my son; how was I going to double up? But it came in a heartbeat. Flowing and pushing its way up out into a smile that my wife lovingly calls my ‘giddy as a kipper’ smile.In the meantime we have been waiting, preparing, fixing things, stair-gating, baby-proofing, John Lewis buying, the Christmas shopping's prepared and wrapped early; yes, we were ready for her arrival.Our daughter came home for good with us a couple of weeks ago. We are exhausted already and I have a pile of ironing taller than me to get through. The dishwasher is on twice daily and the washing machine is on a permanent spin cycle. 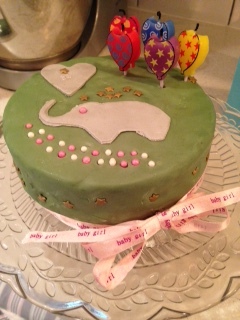 Oh, and on top of that - I almost forgot - my son also asked me to make a cake; a green cake with an elephant on for our celebration as a family of 4. December really is magic this year. I best crack on!